If you were to look up Courtlyn F. in the dictionary, you might find this word: CHARISMATIC. How could we not miss this girl?! 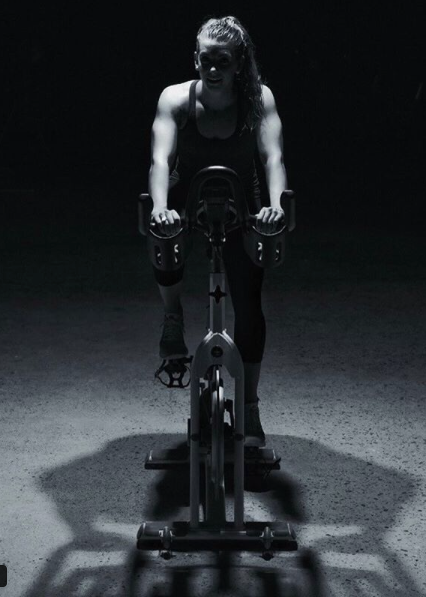 Courtlyn has been rocking the fitness community in Regina for the past few years, with her inspiring, faster-than-you-thought-your-legs-could-move rides, her leadership in the November Project, and her general presence everywhere else she goes. You miss her. We know it. We miss her too. So it's about time we check in with our charismatic Courtlyn and see just what is up in her life these days. As we're sure you heard, she's off on a new adventure. While she's no longer in our midst, we sure think about her a lot. Courtlyn checked in with us to answer some of our questions... maybe today you will be inspired by her words from afar, motivated by the legacy she's left behind, and work to live it out in your next ride in the vault (and anywhere else life takes you)! How does the growth mindset impact your day to day life? I think of the growth mindset as an opportunity to learn something you didn't already know. I am always challenged to discover something about myself I didn't know before... because we don't know what we don't know, until we bring awareness to it... you know? I try to bring awareness to the stories my mind creates. If we do all we know how to in the moment, then that is exactly all we can do. It is from there that we can learn and improve for next time. So before you start to let the negative self talk take over or you start living into the stories you are creating, STOP. Do what you can in that moment and look at it as an opportunity to grow for the next time. If we continue growing and changing, we are just getting stronger and becoming the best version of ourselves. How did the growth mindset impact your decision to head out on this adventure? What challenge do you want to give to your riders/the Wheelhouse community? Keep showing up! Challenge yourself in ways you didn't think possible. Set goals and crush them. It is so easy to create habits or stories that inhibit us from doing the things we want to. Get real with yourself first. Write down what actually matters to you. Disclaimer: it doesn't have to look like anybody else. Stay true to that and you will do amazing things. One last thing: come back to your WHY to remind yourself why you actually started. Remember, where ever you are in your journey... why did you start in the first place? Don't lose sight of that. It can become easy to compare yourself with the goals or successes of others, but always come back to YOUR why, to find peace and celebrate how far you've come or changed. Be gentle with yourself. You are a masterpiece! How have you grown as a person during your time at Wheelhouse? Wow! Where do I even begin? I'll just get real vulnerable and share myself... like I would on the bike. I've known forever that I was not meant to work the corporate life. I remember feeling like an outcast in business school when everyone was applying to get into big corporations, and I was simply not! I had ZERO interest. I felt like I was doing something wrong because of that, and that if I didn't do what everyone else was doing, I wouldn't be a successful 'business person'. Sounds stupid, right? Well, I got a corporate job and after 1.5 years, I figured it out - with the help of Wheelhouse Cycle Club. I wasn't fit for the corporate life and that was perfectly okay! I think my biggest learning and growing has been living my truth. For the longest time, I felt like I needed to do what others thought was best for me, until I realized that I needed to actually start doing what I thought was best for me. Deep down we all know. We get these feelings in our body when it seems right or wrong. No body knows whats best for you, but you. Each time I taught a spin class, I became a little more vulnerable on the bike than the last time. What I began to realize was that we create stories in our heads that prohibit us from living into our fullest, truest, potential. Every time I got on the bike I was actually living my true AUTHENTIC self and let me tell you something, it felt F**ING AMAZING! I'm at peace knowing that my journey doesn't have to look like anyone else's or that my success is not defined by climbing a ladder. Instead, I consider myself successful by helping others reach their fullest potential and discovering things about themselves that they didn't know, all in a dark room, sweating and working to the beat. So good! There's a little something there for each of us to think about. Authenticity is a valuable part of the culture at WHCC and something Courtlyn has modelled on the bike for us. Lastly, Courtlyn, what exactly are you doing on this newfound adventure?? I'm just over here exploring new things, getting lost, and making new memories. We miss you, Courtlyn - your magic of leadership, inspiration, and encouragement... and we wish you all the best! See you when you're back!